Tesla has already shown us some sweet Easter Eggs hidden in the software of the Model S. But now there’s a new one, and if you’re a Mario Kart fan, you’ll love it. Remember that James Bond Lotus submarine easter egg that Tesla showed us last year? That was awesome. 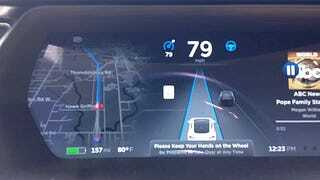 We even said it was the best Model S easter egg around, but now there may be a new champ, as Tesla now has an easter egg that lets your Model S display Rainbow Road on the autopilot display. Tesla, you guys are dorks. But in a good way.